In an attempt to get in on the craft brew bubble, Anheuser-Busch bought a minority stake in the company in 1997, giving Widmer a ride on AB's trucks and increasing their distribution potential exponentially. In 2007, Widmer announced it would merge with Redhook Ale Brewery (another company AB owned a stake in) to form a company named Craft Brewers Alliance, which is currently the seventh largest brewery in the country. The brewers have recreated a classic Belgian style Golden ale that holds true with a unique aroma and flavor. The ale has a hop spiciness that gives it a little extra pop. And at 6.5% ABV the drinker will feel a nice warming sensation while consuming. I figured a special release, and a Belgian-themed one at that, would be an appropriate first review for Widmer, so let's dive in. Appearance: A slightly hazy, golden-orange body. On top, one finger of off-white head that recedes quickly and leaves spotty lacing. Aroma: A complex Belgian mix: coriander, clove, banana, apples, yeast, and sweet, bready malt. Good stuff. Taste: All the same character from the aroma, with the intensity ratcheted up a few notches. There's lots of spices, yeast, and fruit over a solid bready pale malt base. Similar to a Witbier in some ways. The aftertaste is bready malt with a mild bitterness. Mouthfeel: Medium-bodied and smooth with good carbonation. Dries in the finish. Drinkability: Decent enough—if you like the flavor profile you could drink a few of these easily. 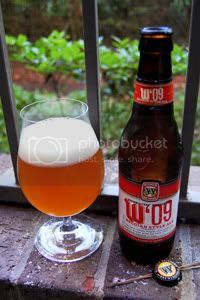 Verdict: W'09 is a tasty enough Belgian-style beer, though it's more of an impression than a recreation if you catch my drift. It seems to me like it might be somewhere in between a Belgian Pale Ale and a Witbier, rather than just a straight-up Belgian Pale, but that doesn't bother me too much. A great beer to introduce some Belgian flavors to the uninitiated, and an okay substitution if you're in the mood for a Belgian but can't find the real stuff. Note: While this review is being published in November, the tasting notes contained within were taken when the beer was fresh this past April.